Although I employ a crude hybrid of the single- and double-arm shifts, my ideal hurdling form is most certainly the former. I just don’t have the necessary skill level to employ an efficient single-arm hurdling action. 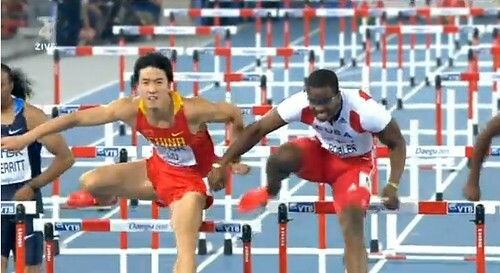 In terms of hurdling skill, it is obvious that I’m a big fan of Liu Xiang 刘翔, as well as Allen Johnson and Colin Jackson. When it comes to arm action, I’m a stickler for the lead arm extension. As the lead leg straightens, the lead arm stretches out as well – as if reaching for the lead foot. Such arm action provides balance, by countering the extension of the lead leg. Swinging the lead arm outwards is a common error amongst beginners. It obviously increases the hang time of the clearance. There are some hurdlers who bend the forearm all the way inside, with the lead forearm running parallel with the chest. For a hurdler, this is a matter of preference. I, for one, try to keep my arm action as faithful to the simple up-and-down movement of sprinting. Taking the lead arm all the way across the chest, in my opinion, complicates the hurdling action. But then again, this is a matter of preference. So long as the arms aren’t wildly flailing and the center of gravity remains level, various nuances of hurdling are acceptable. Perhaps such an arm action enables the hurdler facilitate a more forceful trail leg snap, thanks to the increased leverage provided by the lead arm. Practitioners of this style include the Vukicevic siblings – Christina and Vladimir. Trained by their father, the hurdling technique of the Norwegians are strikingly similar. I stumbled upon clips of their South Africa training session, one can say that they are mirror images of each other! The older Christina, taller than most women hurdlers, is gradually making a name for herself in the international scene. In an event where speedsters tend to get away with flaws in technique, Christina’s hurdling is most efficient. The younger Vladimir, the 2010 World Junior silver medalist, is on-track to following her sister’s footsteps (or shall we say, three-step?). Hurdlers aren’t chipped from one single block. One physical activities determines one’s hurdling style. The big and powerful David Oliver for instance, is more aggressive, in light of his background in American Football. Liu Xiang and Colin Jackson, in contrast, are pure technicians, relying on a fluidly classy form. The difference is technique and, ultimately, style makes the sprint hurdles a lot more interesting to watch. My hand-timed 14.9s in the 110m high hurdles (and my automatically-timed 15.52s) don’t stand for peanuts in the world scene. In the Philippines, these are modestly respectable times, but once I step out of my comfort zone, a slew of sub-15 and sub-14 hurdlers abound. Hence, I’ve often wondered what it feels like to run 14 seconds or 13 seconds. I’m not even talking about the crazy fast times of Liu Xiang 刘翔 and Dayron Robles (although in my constant day dreams I compete with those guys head-to-head!). In a sense, watching Southeast Asian-level or mid-tier elite athletes paint an achievable picture. 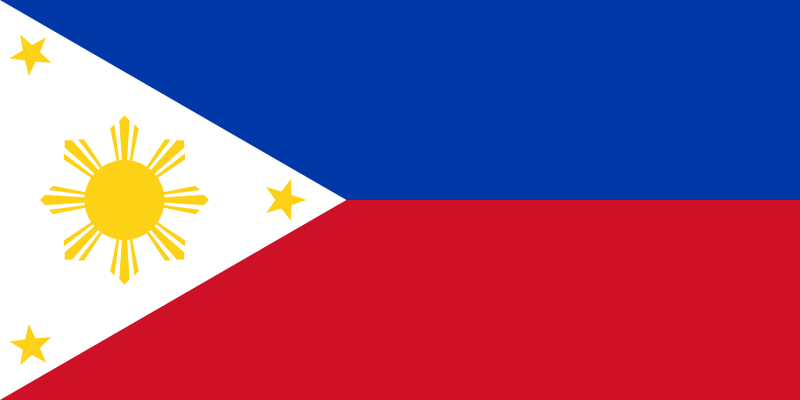 During last summer’s Philippine National Open, Malaysia’s Wan Sofian Rayzam Shah ran practically unopposed, notching an easy low-14 second win. I was awestruck at his sheer speed in between hurdles. He clears the hurdle with little wasted motion. With a personal best of 13.91s, no Filipino hurdler can match up with the 2007 SEA Games gold medalist. For some reason, I was unable to find the 2007 SEA Games hurdles video. The next best thing was the 2010 MAAU video uploaded by Jad Adrian, a Malaysian sprinter. From the vantage point of the computer screen, Rayzam didn’t seem as fast. His hurdle clearance and arm-action are top notch, but he seems to float over the hurdles. And his lead leg seems to lock in midair. Rayzam stopped the clock at 14.19s, two-hundredths of a second off his personal best. In the video suggestions tab in Youtube, I saw a hurdles clip from the 2009 Francophone Games. I clicked the thumbnail, and witnessed the Canadian hurdler Jared MacLeod outclass the competition with a 13.56s clocking. It was more than half-a-second better than Rayzam’s time. That being a mid-13 performance, the difference in speed and rhythm was evident. MacLeod was actually sprinting in between barriers, with nary a pause with each hurdle clearance. But still, he lacks the visible lead leg and trail leg snap and the saber-like lead arm of Liu. MacLeod, being a World Championship semi-finalist, is leagues away from Rayzam. Although I absolutely love watching the cream of the crop of the sprint hurdles compete, I’m also fascinated by the less popular athletes. Watching the likes of Rayzam and MacLeod removes the mystic aura so strong amongst the hurdling elite. They may not be in the same level as Liu, Robles and David Oliver, but for this 15-second hurdler, I look to Rayzam and Macleod with much envy! David Oliver was in scintillating form en route to ruling the 60m hurdles at the BW-Bank Meeting in Karslruhe. The burly American again ran 7.40s to match the time he set in the Sparkassen Cup a week earlier. 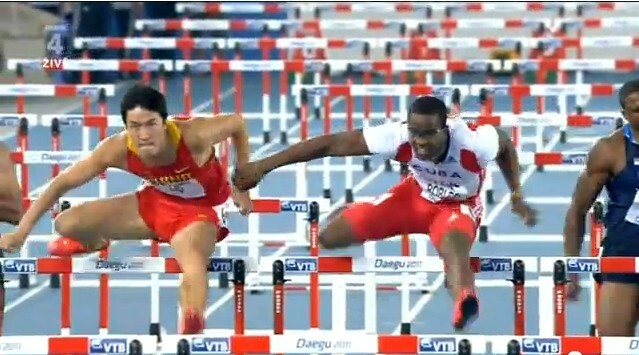 Liu Xiang 刘翔 (7.55s) again finished a close 3rd, this time to France’s Dimitri Bascou (7.53s). Oliver ran like a man possessed, demolishing two or three hurdles in the process. Had Bascou ran a little faster, he would have grazed Oliver, who tends to hog the rightmost side of the lane. Oliver hits the hurdle with his hamstrings, in such a way that forward motion isn’t impeded. Bascou, 4th during last year’s European Championships, ran the (indoor) race of his life in setting a new personal best – and claiming the scalp of the 2004 Olympic Champion. Oliver, with his unique 7-step start is fastest off the blocks. Liu, who uses the traditional 8-stride pattern, was about half a stride behind the undisputed 2010 world leader. I couldn’t help but notice how Oliver limped after the race. It was evident that something was mildly wrong. In a tweet, Oliver complained of a cramp in his calf but said it was “nothing serious.” I wish the best for Oliver. He’s a nice guy and a great competitor, in the mold of the long line gentlemen sprint hurdlers. This year has the makings of a banner season for the sprint hurdles, with Liu, Oliver and Dayron Robles squaring off at the Daegu World Championships. 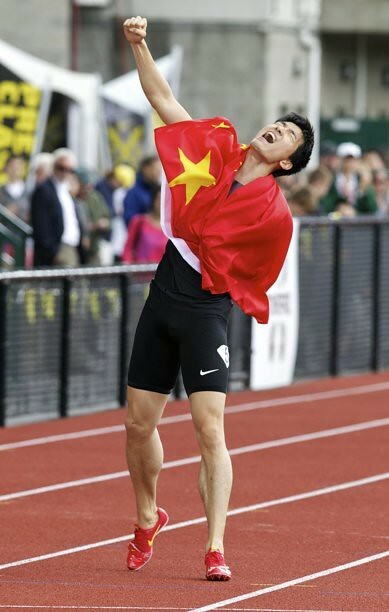 Liu was able to shave off a huge five-hundredths of second off his 7.60s mark in Dusseldorf. C’mon Liu! Show them what you got! I am not a Dayron Robles fan. Watching the fine clip below, however, reiterated Robles’ status as the world record holder. What I don’t like about Robles’ form is his flailing trail arm. 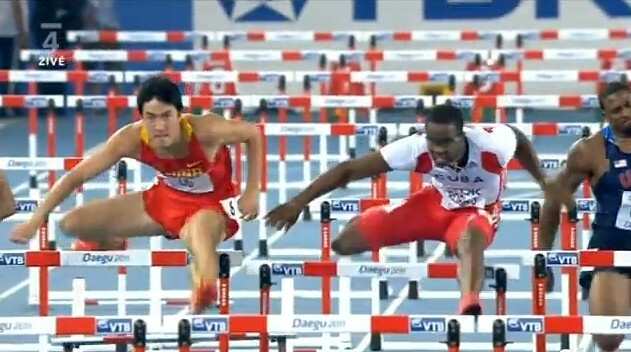 Instead of a straightforward swing like Liu Xiang 刘翔 and Colin Jackson, Robles’ left arm tends to push outwards first, before settling at the hip as the lead leg clears the hurdle. On a lesser note, Robles’ trail leg, unlike Liu’s, isn’t parallel to the hurdle crossbar upon clearance. But then again, Robles’ excellent lead leg extension and trail leg action more than compensates for these minor deficiencies. The world record holder’s lead leg swoops over the hurdling at lightning speed. He brings his trail knee high underneath his shoulders. Robles’ leg action is picture perfect – a testament to Robles’ skills as a fine hurdling technician and to his coach, Santiago Arunez’s tried and tested coaching approach. 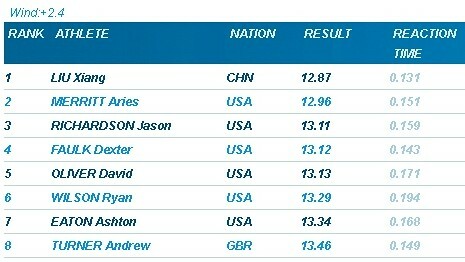 Irregardless, I still think that Liu Xiang will trump Robles and David Oliver come the Daegu 2011! Brianna Glenn is this week’s track beauty! The American long jumper has a personal of 6.81m, set in 2008. In major meets, the 30-year old had finished 9th in the 2009 Berlin World Championships, leaping 6.59m. Recently, Glenn got 7th place at the IAAF Continental Cup held in Split, Croatia, with a modest leap of 6.28m. A promising 2008 Olympic campaign was cut short by a knee injury. She had surgery a few weeks before the cutthroat U.S. Olympic Trials. Glenn had also distinguished herself off the track, maintaining a 3.5 GPA throughout her college days in the University of Arizona. Like her compatriot David Oliver, Glenn maintains an informative blog, which in my opinion, is one of the best elite athlete blogs out there.